When you visit Fredericksburg, Texas and the Texas Hill Country in October, make sure to bring your camera! 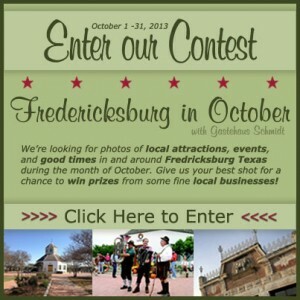 We’re sponsoring a photo contest, looking for your best photos of Fredericksburg landmarks and activities. You could win two short wine tours from Texas Wine Tours or two tickets to Rockbox Theater. Naturally, there are rules. Click the image to go to the entry page on Facebook and check them out. You do have to “Like” us on Facebook to enter. The winner will be chosen by an independent panel of judges between November 15 and November 31. The winner will be posted on our Facebook page on December 15 by 6 pm Central Time. Enjoy your visit to Fredericksburg. And take some photos!